In Mexico, December 12, Virgin of Guadalupe Day, is a national holiday, and often as many as five million Mexicans— many crawling on bloodied knees—make their annual pilgrimage to the country's most venerated shrine, a basilica for the Virgin Mary in Mexico City. In 1996, eight people were killed and 15 were injured in the press of pilgrims gathered around the site. The story of the Virgin of Guadalupe is one of a mystery within a miracle. In 1531, a 57-year-old Aztec Indian named Juan Diego (1474–1548), whose native name Cuauhtlatoatzin means "eagle that sings" (or in some translations, "eagle that talks"), claimed to have encountered the Blessed Virgin Mary on four occasions in desolate regions outside of Mexico City. At first she appeared as a beautiful, dark-skinned 14-year-old Mexican Indian girl, who then revealed herself as the "ever-virgin Mary, Mother of God." During later appearances, Mother Mary told Diego that she wished a church built to her in the place where she appeared to him–Guadalupe, the river of the wolf. As proof of her holy appearances, the Queen of Heaven projected an image of herself upon his tilma (cloak). It is that artifact that brought Bishop Juan de Zumarraga (1468–1548) of Mexico City and his entire household to their knees when he asked for some kind of tangible sign from the Holy Mother. It is that same image on the tilma, set in gold at the center of an elaborate altar, that still awaits today's pilgrim at the basilica of the Virgin of Guadalupe. It has been said that the dark-skinned image of Mother Mary as a virginal Native American girl helped the Spanish priests convert millions of Mexican Indians to Catholicism. After an extensive examination, the committee from the Holy See in Rome declared the apparitions seen by Juan Diego to be authentic, thus making the miracle one of seven appearances of Mother Mary officially recognized by the Vatican. 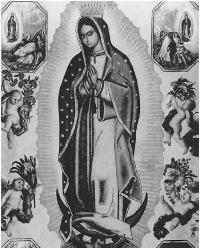 Then, in 1929, an image was discovered within the right eye of the image of the Virgin on Juan Diego's tilma. Alfonso Marcue, official photographer of the old Basilica of Guadalupe in Mexico City, discovered what appeared to be a clear image of a bearded man reflected within the right eye of the Virgin. At first doubting his own senses, Marcue made many black-and-white photographs of the image; and after he had examined them exhaustively, he went to the authorities of the basilica with his incredible finding. He was told to remain silent about his discovery, and out of respect for the church officials, he did. On May 29, 1951, Jose Carlos Salinas Chavez was examining a particularly good photograph of the face of the Virgin and rediscovered what clearly appeared to be the image of a bearded man reflected in both the right and left eyes of Mother Mary. Since that time, more than 20 experts, including a number of ophthalmologists, have carefully inspected the eyes and the mysterious image. On March 27, 1956, Dr. Javier Torroella Bueno, a prestigious ophthalmologist, certified the presence of the triple reflection (Samson-Purkinje effect) characteristic of all live human eyes and stated that the resulting images of the bearded man were located precisely where they should be according to such an effect. Bueno also pointed out that the distortion of the images agreed with the normal curvature of the cornea. In that same year, another experienced ophthalmologist, Dr. Rafael Torrija Lavoignet, using an ophthalmoscope, studied the apparent human figure in the corneas of both eyes, with the location and distortion of a normal human eye, and found that the Virgin's eyes appeared "strangely alive" when he examined them. While working at IBM in 1979, Dr. Jose Aste Tonsmann, a graduate of environmental systems engineering of Cornell University, scanned a photograph of the Virgin's face on the tilma and was astonished to discover what he believed to be other human figures reflected in the eyes. Aste Tonsmann has since theorized that Our Lady of Guadalupe not only left a miraculous image as proof of her apparition to Juan Diego, but may also have left some important messages hidden in her eyes that could not be revealed until new technologies would permit them to be discovered. Another mystery that had puzzled academic researchers into the phenomena surrounding the Virgin of Guadalupe was how the colored image of the apparition could have been impressed upon the simple tilma of a poor Aztec tribesman and how it could have lasted for centuries without falling apart. As early as the eighteenth century, scientists discovered that it was impossible to paint such an image in a fabric of such texture. The ayate fibers used by the Aztecs at that time deteriorated after 20 years. Richard Kuhn (1900–1967), a Nobel Prize winner in chemistry, stated in his report of the tilma that it had not been painted with natural, animal, or mineral colorings. Since there were no synthetic colorings in 1531, the possibility of a native artist accomplishing a hoax seems out of the question. In January 2001, Dr. Jose Aste Tonsmann, now with the Mexican Center of Guadalupan Studies, revealed at a conference at the Pontifical Athenaeum Regina Apostolorum in Rome that advances in digital photography now revealed that the images in the Virgin's eyes were those assembled with Bishop Juan de Zumarraga when Juan Diego first unfurled his tilma and displayed the miraculous image. By magnifying the iris of the Virgin's eyes 2,500 times and, through mathematical and optical procedures, Aste Tonsmann feels that he is able to identify all the people imprinted in the eyes. In other words, the Virgin's eyes bear a kind of instant photograph of what occurred the moment the image was unveiled before the bishop. Delaney, John J., ed. A Woman Clothed with the Sun. New York: Doubleday, Image Books, 1961. Our Lady of Guadalupe. http://www.sancta.org/eyes.html. 14 August 2001. "Science Stunned by Virgin of Guadalupe's Eyes: Engineer Sees a Reflection, Literally, from a Scene in 1531," Zenit News Agency, 15 January 2001.
who is the man in the eye? who is the other man in the other eye? who is the angel and why don't his head show in thes picture on this page? « Is There a Hidden Code in the Bible?